Gio has become my 400th Follower, so welcome Gio and all new bloggers who have joined since before my holiday. I am so happy you have become part of my creative journey, which has certainly taken a new turn in the last few weeks. As you know I have joined the Crafty Individuals DT, which is very exciting, so there is lots to celebrate which is a perfect reason to have a Give-Away. If I find anything else before the end of September I will add it into the collection. 1. Post this picture on your sidebar. 2. Make sure you are a follower. 3. Link to this post using the inlinkz below. 4. Leave a comment telling me you have entered. The Give-Away closes on the 30th September and I will draw the winner using Random Org soon after. Anyone who is not eligible will not be included. I will post worldwide. Thanks to all of you who take the time to visit and to those who also leave fabulous comments, this is such an amazing and supportive community. I have made so many blogging friends and acquaintances and have been privileged to meet some of you in person. Good luck with the draw and have a happy, creative September. Thanks for joining the Give-Away, please leave your link below. OMG Brenda...what a huge milestone! Congratulations! I have entered in the fun and posted your pic. And such an awesome giveaway...enjoy! Hope you had a wonderful vacation and are creatively refreshed and ready to roll!! Thanks for the chance Brenda. Congrats on reaching your 400th follower, a fantastic achievement, well deserved. Congratulations on all those Followers, Brenda, that's amazing and congratulations too on the Crafty Individuals DT, they are lucky to have you, your work is fantastic. I have linked your gorgeous candy to my sidebar. Thanks so much for the chance to win. Wow! 400 is quite something... so happy to be one of them! Congrats!! 400 followers - wow! Your candy looks yummy so I'm entering. I linked up but my photo that I selected didn't show up - not what I did wrong on that one! Will put the photo on the sidebar just as soon as I can. Thanks for visiting me this weekend. I really enjoyed making the dessert plate. What a huge milestone, indeed. I'm so happy for you! This is an incredibly generous giveaway. Good luck to all! Congrats Brenda on hitting the 400 mark, no doubt it will double soon. I've added you to my sidebar. P.s I got your email at the new address . Wow scary stuff with the paypal thing. Congrats Brenda on 400 followers...I am now 401! I found your site through Frilly and Funkie and love your style! Thanks for the chance to win some great goodies...I posted and linked, hope you visit me too! Many congratulations on your 400 Brenda which is no surprise to me with your gorgeous creations. Your candy is now on my sidebar. Congrats, Brenda! I also hit 400!! I have added this to my sidebar, but since I have most of the items, don't count me! Not to mention, I already hit the jackpot with your generosity! Big Hugs! Well done Brenda on your followers and your blog deserves to be noticed. This is such a generous giveaway from you and thanksd for the chance to enter it. I would love to be entered for your giveaway, thanks for sharing and congratulations on your DT appointment. Hi Brenda - love and adore this Timmy stash - wow and a really really nice selection - do hope Oz in included as we are a long way away but no worries of not able. Congratulation on all those follower and on joining the CI DT. So many wonderful reasons to celebrate. Lovely candy giveaway. I would love to have chance. I've linked to my blog sidebar and I'm an old follower. great give a way. Following you is easy. Love your artwork. Hi! I'm a new follower (Yay), I've put the pic on my sidebar, I'm #34 on the Link List and I'm commenting to tell you :). AWESOME giveaway! Thanks! 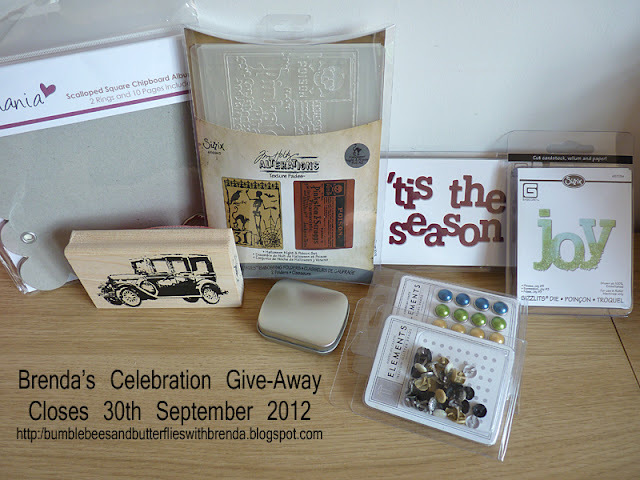 Hi Brenda, I've been a follower for some time so have no idea how I came to miss this fabulous give away! I must've been enraptured by your art work... tee hee! How on earth did I manage to miss this! What an incredibly generous Giveaway. I am a Follower Brenda and I will of course add to my sidebar. Thank you for the opportunity to win those amazing goodies. The giveaway is super lovely !!! Hi Brenda ;-) Candy is beautyfull. Congratulations on your followers. Blog is amazing. I love your blog! I find a lot of great inspiration! Also thanks for giving me the chance to win the amazing candy! Congrats on your followers...well done girl! I paged back and liked what i saw...I am your latest follower. Thanks for the chance to win your Candy. Congrats on ur 400 followers Brenda. Awesome candy. U r so generous. Thanks for the lovely chance to enter it.Have posted the candy pic on my blog's sidebar. I found this link at froebelsternchen. I am happy, that I found this wonderful link. So, now I am a new folower.